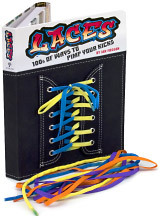 Ian's Shoelace Site – Ian's Book "Laces"
"Laces", the book based on this website, was published in 2007. Like the website, this book is the world's most comprehensive reference about shoelaces. 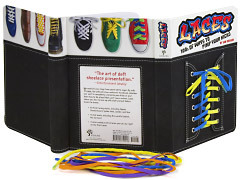 "Laces" comes with color-coded laces that match the lacing diagrams, and has an "interactive" front cover that can be used as a practice shoe. 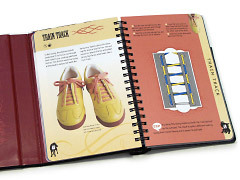 The pages are filled with trendy looking shoes laced in amazing patterns. Sadly, "Laces" is now out of print, so copies are getting ever more scarce. Here's a view of the book's triple-fold cover opened out completely. This design allows the front cover, which comes complete with eyelets, flaps and color-coded laces, to be folded in alongside the lacing diagrams so that you can try out the lacing methods. 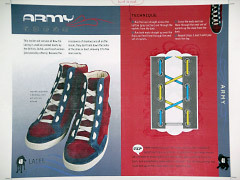 Here's a sample spread of one of the lacing methods, "Army Lacing", as it appeared in an early proof print. You can even see one of my corrections at the top of the right page. Another sample spread, this time of "Train Track Lacing", which made its debut in the finished book. Note how the color schemes complement the featured sneakers. 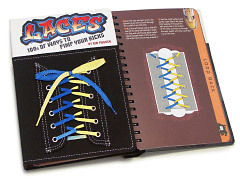 When you find a lacing method you'd like to try, the book's cover can be folded over the left page so that you can use the color-coded laces to follow the diagram and instructions on the right page. No more awkward bending down and fiddling with your shoes! 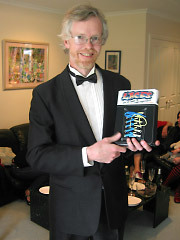 Here's me proudly holding one of the first copies of "Laces" at the Australian launch in October 2007. It's a pity that this photo doesn't extend low enough to show my feet! I had livened up this tuxedo by wearing a pair of Converse double upper sneakers, laced with Aussie green and gold shoelaces, with each foot sporting a different (and as yet unpublished) lacing pattern! "Laces" is now out of print, but you may still be able to find a copy on-line at a reasonable price. Lacing methods, shoelace knots and more, available as an app for iPhone, iPod Touch and iPad.